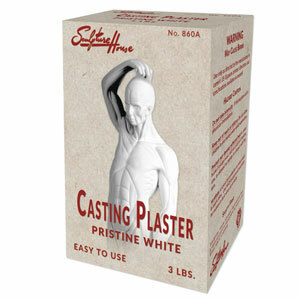 Pristine White Casting Plaster - 3 lbs. Home → → Pristine White Casting Plaster - 3 lbs. When looking to reproduce a piece of sculpture, a mold and cast of the piece must be made in one of a variety of casting mediums. Casting plaster is the most commonly used medium in casting sculpture. Our Pristine White Casting Plaster, a US Gypsum product, is a pure white, smooth, slow setting plaster for casts, molds, and direct modeling. Can be used for mother molds and has enough strength to create a positive cast. Best used for hollow castings, patterns, figurines, and commercial castings. Packaged in a 3-lb. box.